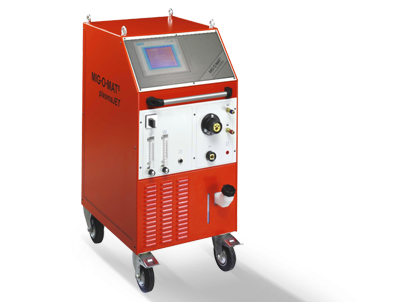 The MIG·O·MAT plasmaJET 250SPS is specially designed for automatic and robot welding systems. Equipped with a modular based Siemens SPC control device the plasmaJET unit offer an easy operation and a high degree of process safety and flexibility, so that huge number of special customer requirements and adaptions can be realized. The integrated high-performance cooling system with monitoring of the coolant flow-rate with is designed for the high demands of the plasma welding process and in particular the plasma welding torch. The universell designed welding program flow provides a huge number of adaptions on different welding applica-tions by the modes of operation e.g. 2-cycle/4-cycle, timing control, plasma spot welding and control voltage*. The operation is made by a robust touchdisplay with graphic indication of welding flow and is very easy in handling. For a simple handling, the display can be demounted from the welding unit and it can be integrated into the custom-ers control desk*.